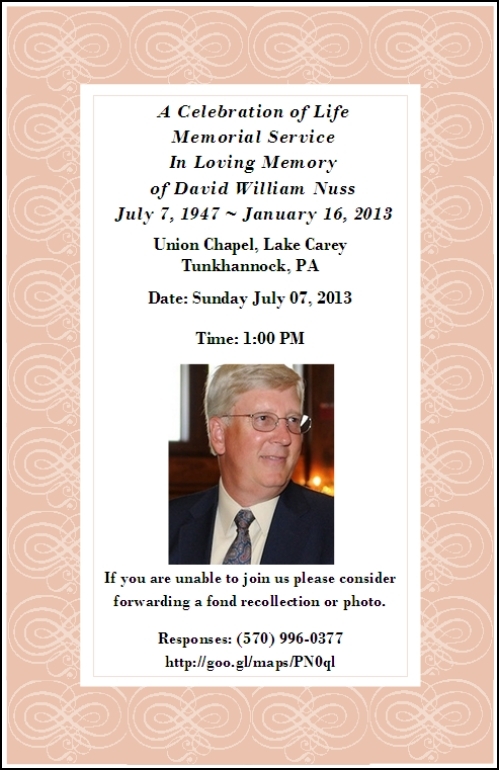 The Hi-Lites Motor Club will be attending Dave Nuss's Memorial Service On Sunday July 7th. As most are well aware, Dave served as the club's secretary for many years and was a cornerstone of the club. We will be trying to show every ounce of support our club can put together. We are sure every club member will want to be in attendance with their car to honor Dave and support his family. Please see the flyer below. We will be meeting at the New WalMart in Tunkhannock at 12:15 and traveling as a group to the church. The attendance of so many club members at David's Celebration of Life Service is a kindness that will not be forgotten. Thank you from the bottom of my heart.